A few days ago, I was staring at a bunch of rapidly ripening bananas sitting in the kitchen, calling out to me. It was after dinner, and I was just not in the mood to eat bananas, yet I really didn't want them to go to waste. A thought popped into my head to make bananas foster as a way to use up some of those bananas, disguised in dessert form. And you know, sometimes we get the idea that restaurant desserts are really hard to make at home, but the truth is that sometimes they are so incredibly easy to make that once you've figured it out, you'll never burn your money on them again. Bananas foster is certain one of them. 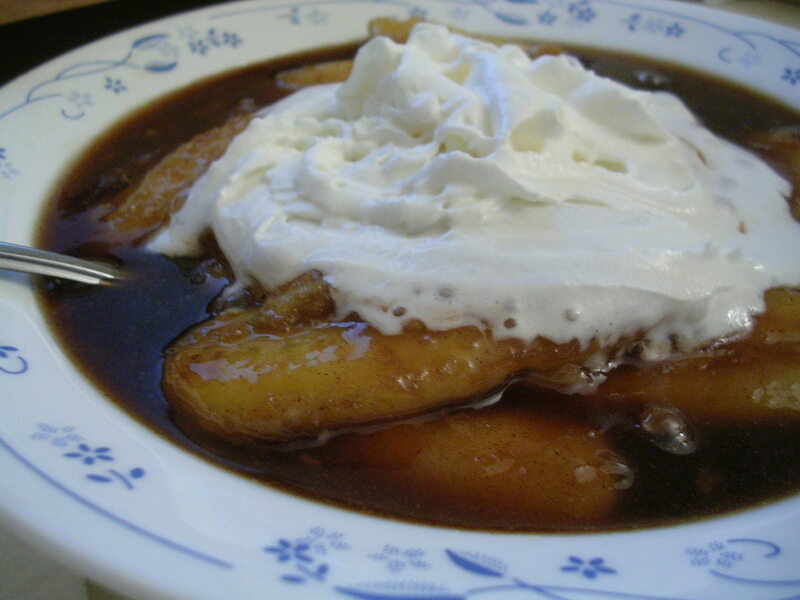 Traditionally, bananas foster is a dessert in which bananas are cooked in a brown sugar based sauce, with banana liqueur and rum added and then burned off for flavor and effect (this is called a flambe). While the flaming bananas foster is exciting and certainly doable at home, I didn't want to play with fire since I neither had a pan with a long handle nor a long match or lighter to set the alcohol on fire in the pan. But if you have these tools, you can simply light the alcohol in the saucepan from a distance, and it will flame with a pretty blue color until the alcohol burns off. The recipe I used comes from Allrecipes.com, and doesn't burn off the alcohol, so I replaced some of the alcohol with water, since I didn't want the taste to be too strong in the final sauce. In the end I didn't really taste any of it, so you can probably add more to get the flavor. 1. Melt butter on medium heat in a skillet. 2. Add brown sugar and stir well to obtain a thick sludge. Stir in vanilla, cinnamon, and alcohol and/or water. 3. Continue to stir the sauce until it bubbles and becomes liquid (the brown sugar will melt). Add in bananas and heat until warmed through, about 2 minutes. This entry was posted on Monday, February 4th, 2008 at 6:07 pm	and posted in baking, desserts, French, fruit and nuts, recipes, Uncategorized. You can follow any responses to this entry through the RSS 2.0 feed. I go to a restaurant that puts the bananas foster on crepes and french toast. It's really good that way too. What a refreshing change to banana bread. Looks yummy! yummy!!!! Looks awesome! I'll have to try it!!! Looks divine! I must try that too! There is NO substitute for butter in this type of cooking process. Don't do it. It will turn out badly. Thanks Kathleen, I haven't tried anything else yet but it's good to know!